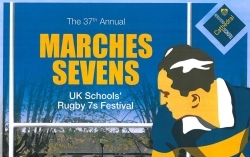 The 37th Annual Marches 7s. An excellent day of Rugby on the banks of the River Wye on 1st March 2015. 32 top flight 6th form teams compete for the trophy. Welsh rugby international Paul Thorburn (OH 1974-1981)) to speak at Lunch. Book you seat now. £30 for two course meal.